Merry Christmas from Rockefeller Center! Spent a lovely five days and nights in NYC at Christmas. Saw two fun shows - "Spamalot" and "Is He Dead?" - and the Christmas show at Radio City Music Hall - all highly recommended. Enjoyed several evenings wandering through the holiday shops and watching the ice skaters at Bryant Park. Although the ice rink at Rockefeller Center is the famous one, Bryant Park is beautiful and it is not crowded so you can watch from the rink wall, shouting out encouragement to the newbies of all ages. Great fun, and some of the skaters are excellent. Took youngest child to see Santa at Macy's. Although the Macy windows were a disappointment (the Bergdorf Goodman and Lord & Taylor windows were much better), the Santa we visited at Macy's was the REAL SANTA! The beard, the voice, the laugh, the Santa outfit - SPECTACULAR! 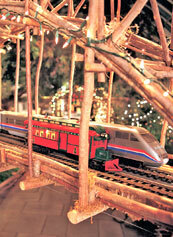 And despite having dealt with crowds for hours, ALL the elves were smiling and full of Christmas cheer. The Christmas tree at the Met was, as always, beautiful and worth the trip. Had an outstanding meal in Chinatown at Sanur and good dim sum at The Chatham. Also had a very good lunch at Toasties and enjoyed the jazz brunch at Rare Bar & Grill in the Shelburne Hotel. 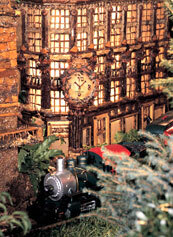 The holiday train show at Grand Central is always fun. Midnight Mass at St. Malachy's on West 49th had good singing and music - good homily, too! The 7-day unlimited ride Metro card for only $24 made it easy to go all over the city using the subway and buses. An amazing bargain. "New Yorkers should really never be included in any survey of what normal Americans do." The Christmas Tree and Neapolitan Baroque Crèche at the Metropolitan Museum of Art in NYC, November 20, 2007 - January 6, 2008. If you want to see a holiday panto this Christmas, we found one in DC and another in Malvern, PA. Let us know if you are aware of any holiday pantos in or near NYC. 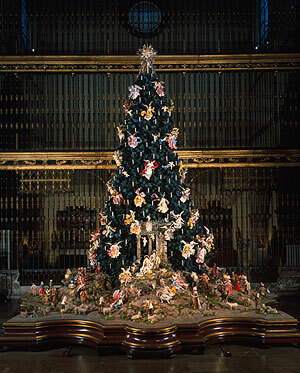 One of our favorite things to do around Christmas is see the Christmas Tree and Neapolitan Baroque Crèche at the Met. In this annual event, a vivid 18th-century Neapolitan Nativity scene (embellished with diminutive, lifelike attendant figures and hovering, silk-robed angels) adorns a candlelit 20-foot blue spruce.